It’s difficult not to love these cute, fluffy, and friendly Miniature Huskies the moment you look at them. It’s no wonder there are so many questions revolving around this super adorable breed. In this article, we will get to know these endearing little dogs by answering the top 10 questions people ask about them. 1. What is a Miniature Husky? 2. How do you get a miniature dog breed? 3. What does a Miniature Husky look like? 4. How big is a Miniature Husky? 5. What is the temperament of a Miniature Husky? The Miniature Husky is good with kids and loves family. They are known escape artists. They are playful and energetic. They don’t bark, but they howl. 6. Does the Miniature Siberian Husky have any health problems? 7. How do you care for your Miniature Husky? 8. Can a Miniature Husky live in a hot climate? 9. Is training a Miniature Husky difficult? 10. Where can I buy a Miniature Husky? Final verdict: are Miniature Huskies good pets? A Miniature Husky or Mini Husky is a smaller version of the Siberian Husky. A breeder named Bree Normandin developed the Mini Husky in the 1990s, with the goal to create a tinier version of the beloved Siberian Husky. The Siberian Husky is one of the most popular dog breeds in the US. Huskies are originally from Siberia and are classified as smart working dogs. They are also known to be active and friendly and are great family dogs. The American Kennel Club does not recognize the Mini Husky as another breed of dog nor as a variety of a Siberian Husky. Crossbreeding, or breeding a standard breed with a smaller breed of dogs. An example of this is the crossbreeding of a Golden Retriever with a Dachshund or Golden Dox. Developing new breeds by introducing genes that cause dwarfism to create a miniature. Miniature Huskies were developed using the third method. 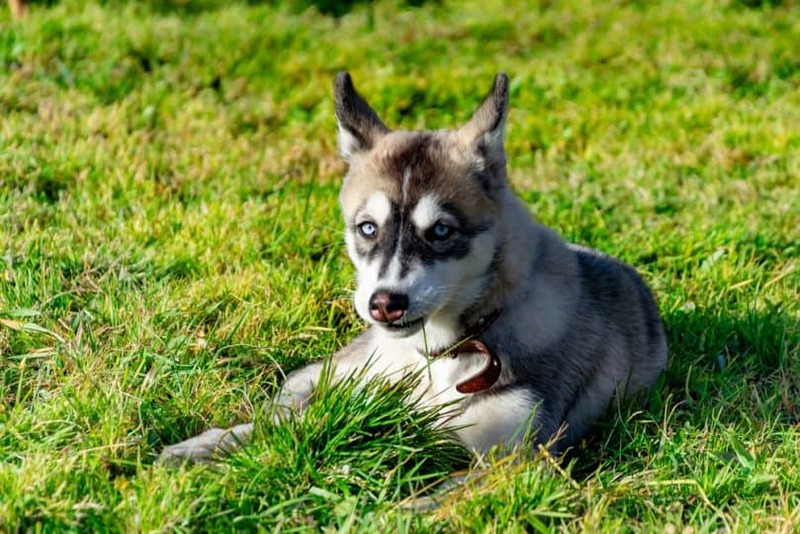 Bree Normandin took smaller-than-the-standard-size Huskies, bred these dogs together, and created Miniature Huskies. A Mini Husky has the same physical features as a regular Siberian Husky. Mini Huskies also have a wolf-like appearance with erect ears, expressive almond eyes, and fluffy coats. Its eyes are the Huksy’s most noticeable feature. A Miniature Husky has piercing eyes that can either be blue or brown. This breed often has bi-colored eyes, a condition called heterochromia, meaning one eye may be a different color than the other. Like Siberian Huskies, Mini Huskies have double coats that are dense and thick to protect them from cold weather. These coats come in combination of shades in black, white, copper, red, gray, and platinum. Mini Huskies are typically half the size of a standard Siberian Husky. A full grown Miniature Siberian Husky can weigh 15 to 30 lbs (7 to 13 kg) and can be 12-16 inches (31 to 41 cm) in height. 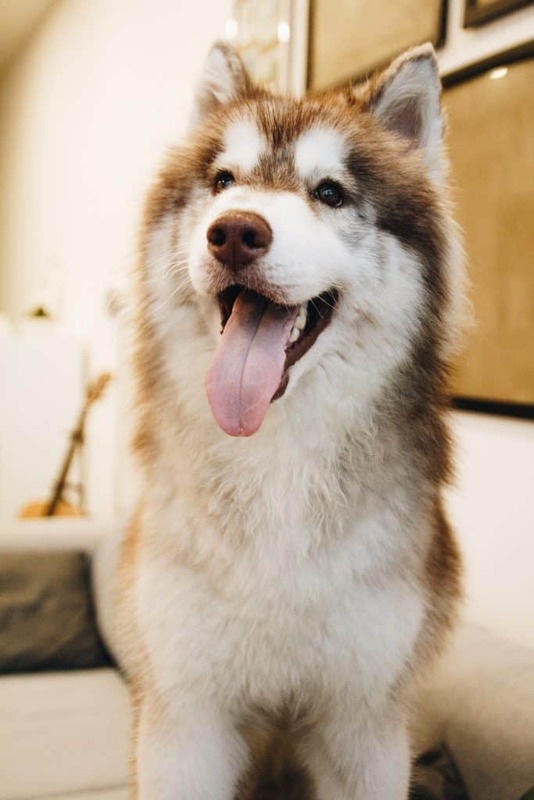 A Mini Siberian Husky’s size is what makes this dog endearing for some people, as this small breed has all the good qualities of a Siberian Husky in a more manageable form. Even if you live in an apartment, the Miniature Husky will be a great dog for your family. Now that we’ve established that these Mini Huskies are undeniably cute, it’s time to find out if their personality is as adorable as their looks. Mini Huskies are friendly and gentle dogs. They are good with kids and will get along with all members of the family. They love human attention, but they are not the clingy type of pet. Their perfect idea of togetherness is play so they prefer running with you outdoors to staying in the house and sitting on your lap. 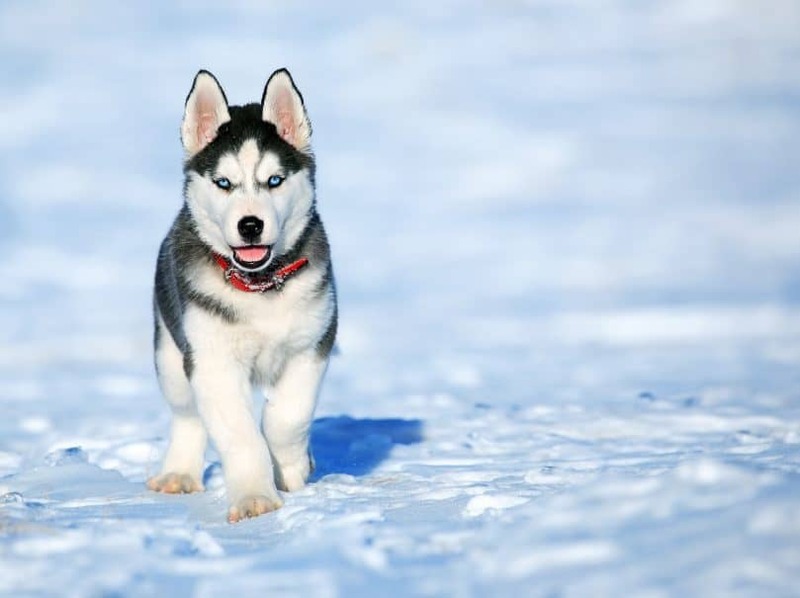 Mini Huskies are curious dogs and are natural wanderers. They are known in the doggie world as escape artists, they tend to jump off a fence or run away when you let them off their leash. Mini Huskies are playful and have high energy levels like the bigger Siberian Huskies. They need to have at least 30 minutes of exercise and playtime on a daily basis to use their pent-up energy. Mini Huskies can develop problem behaviors such as digging or chewing when they have nothing to do. If you love outdoor activities, then you’ll get along well with this breed. Just make sure to bring your leash as Miniature Huskies have a high prey drive. They will chase smaller animals like cats and rabbits. Miniature Huskies don’t like to bark, but they howl like their wolf cousins. You may have to spend some time training your dog to keep your Miniature Husky from howling and disrupting your household. A Miniature Husky is vulnerable to the same health conditions as a standard-sized Siberian Husky. Eye problems like glaucoma, cataracts and progressive retinal atrophy are common in Siberian Huskies. Regularly check your dog’s eyes to see if anything looks out of the ordinary, like cloudy eyes or secretions. A Mini Husky can also suffer from skin problems such as follicular dysplasia. You can check for patchy hair loss or scaly infected skin. Sometimes, a Miniature Husky develops allergies under its fur, too. Brushing their coats on a regular basis will help you notice symptoms such as hair loss or redness of skin due to irritation. It’s best to consult your vet once these symptoms arise to prevent more serious health issues. Hypothyroidism can also be an issue, but it can be avoided if your Miniature Husky is tested for it every two years. Some symptoms may include lethargy, exercise intolerance, and cold intolerance. Overall, regular visits to the vet and basic care ensure good health for your beloved pooch. A healthy Miniature Husky has a life expectancy of 12 to 15 years. Siberian Huskies spend hours self-grooming and self-cleaning. They do not like being dirty, but that doesn’t mean you don’t have to groom their coats. Mini Huskies, like the regular Siberian Huskies, usually only shed during the spring and the fall. Once-a-week brushing should be enough in non-shedding season, but they require extra brushing sessions during shedding season. Because of its heavy seasonal shedding, the Miniature Husky is not hypoallergenic. Unlike other dogs, a Miniature Husky knows how to control its food intake so overfeeding will not be an issue. Adult Miniature Huskies should eat twice a day. Just make sure they eat two hours before exercise and 30 minutes after exercise for digestion. The best dog food for Huskies will also be beneficial to the Mini Husky’s diet. Yes. Mini Huskies can survive hot climate, but they would have to be hydrated all the time. Be prepared to have water available for your pet. You may also want to buy a small outdoor inflatable pool for them to cool off. Shaving their coat is not a solution to keeping these dogs cool in hot weather as their coat is also designed to protect them from the sun. Although Mini Huskies can do well in warmer climates, they will do better where the climate is cold. Their coats are designed to protects them from harsh cold weather. Miniature Huskies are intelligent dogs, but they are also independent and not the most obedient of breeds. There would be instances when they choose not to follow your commands. Huskies have to be trained at an early age to curb their stubborness. The Mini Husky usually has an average attention span. Its mind tends to wander off when training takes too long or if you’re trying to make it do too many things. Training sessions for these dogs should be fun and short. Your Mini Huskies should see you as the pack leader. You always have to be assertive and firm. 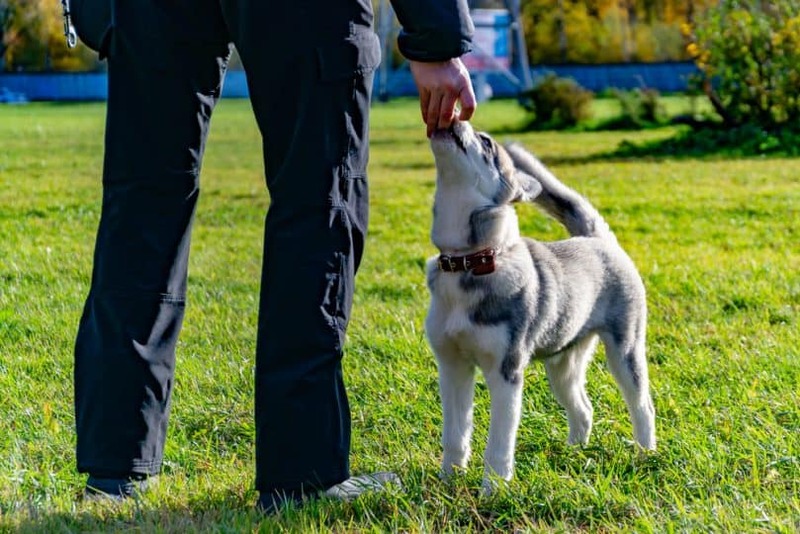 Positive reinforcement such as praise and treats will yield good results with your Miniature Husky, so take notice when it does follow your commands. Like the standard Siberian Husky, these smaller Huskies are better suited for owners who have had experience with training other dogs. Training a Mini Siberian Husky requires patience and consistency. A Miniature Husky puppy cost about $600 to $1500 each. 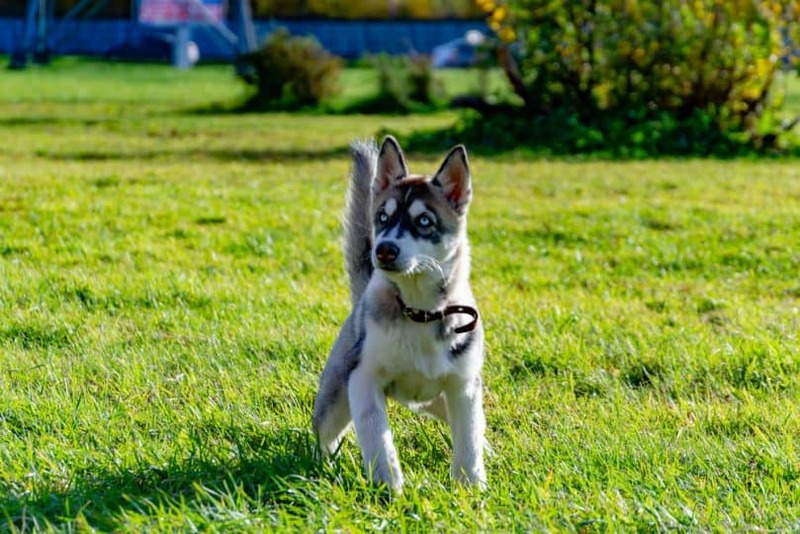 Finding a good breeder or a kennel for the Miniature Siberian Husky may be challenging, but you may check these breeders that specialize in producing Siberian Huskies. You can also look for Miniature Husky dogs for adoption or rescue. This is ideal if you don’t want to spend time training a Mini Husky puppy. If you are someone who has enough time for consistent training and play, then this fluffy and friendly miniature breed is for you. Grooming the Mini Husky also requires dedication and patience. Do you have a Miniature Husky? Tell us all about them in the comments section.